Team Suzuki Press Office – April 25. 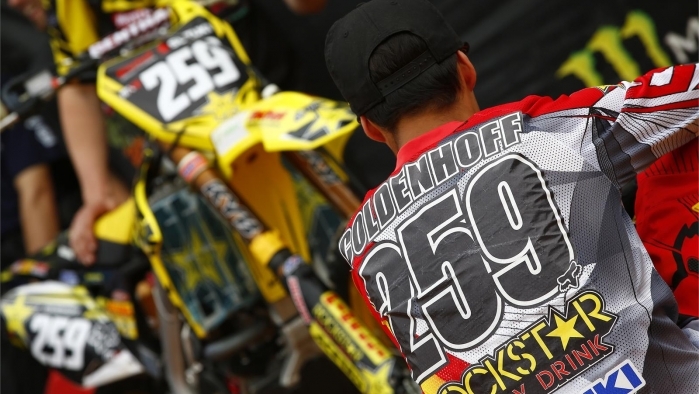 Rockstar Energy Suzuki Europe’s Glenn Coldenhoff will miss out on his 2014 FIM MX2 Motocross World Championship dream after sustaining a left knee injury while training this week at Honda Park in Holland. The Dutchman, who has won two from the last six motos in the MX2 class - and is currently third in the FIM series standings with the works RM-Z250 - lost control of his machine cresting a jump, landed awkwardly and ripped-away the exterior lateral ligament as well as sustaining a compression-fracture. Coldenhoff will have surgery performed by Doctor Richter at the Ortema facility in Ludwigsburg in Germany today (Friday) where he will have a bone graft. It is anticipated that the Dutch Championship leader will miss around three months if the rehab programme goes to plan. Hopefully, he still might make one-or-two of the last meetings of the year. It is a bitter setback for the rider who was set to try and increase his lead in the domestic competition and was looking forward to contesting his home Grand Prix at Valkenswaard next weekend. For the team also there is a feeling of disbelief after such a strong start to the 2014 campaign. Said Coldenhoff: “I am so disappointed. I scrubbed a jump and must have just caught my wheel because it set me a little short; I almost saved it. There was a lot of pain initially and we went straight for a check but the x-ray didn’t reveal much damage due to the swelling. It is only when we saw the MRI that we got the bad news.